If you are looking for an app to improve your EnglishConversationskill and help you speak English more fluently, thisapp issuitable for you. This app also includes the list of mostcommonwords and phrases in English used in daily conversations. Itwillhelp you speak English fluently. 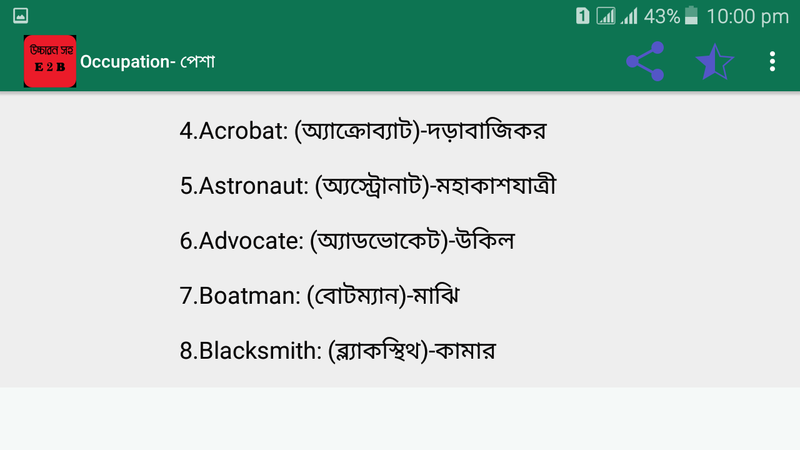 This app ( বাংলাদেশের ইতিহাস ) covers the basic of each step ofBangladesh History from the beginning. You will get info about whenpeople started living in Bangladesh, who were governing, how theyhave been defeated by new government, how the Language-War of 1952started, how the independence war started and how new governmentnamed Awami-league, BNP and Jatiyo Party started governingBangladesh. 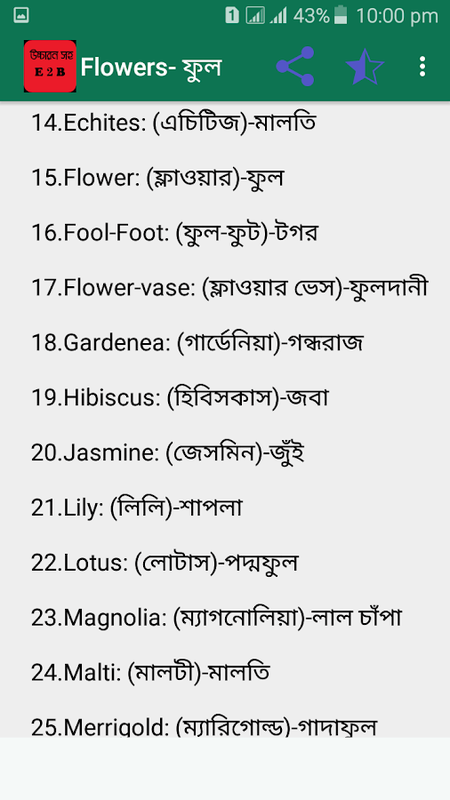 বিস্তারিত আপডেটঃ - শেখ মুজিব হত্যা। - বাংলাদেশেরউত্থান। - ছিয়াত্তরের মনন্তর। - বঙ্গভঙ্গ। - ভাষা আন্দোলন। -মুক্তিযুদ্ধ ১৯৭১। History of Bangladesh app is for educationalpurpose and no in-depth resources added. Hope to add more info atnear future. Existing content rights are reserved to Wikipedia.org.Any review or suggestions would be appreciated to make this appbetter and resourceful at near future. Play, Learn and Speak – discover common phrases for daily Frenchconversation! ✔ 5,000 useful phrases for conversation. ✔ LearnFrench in your tongue (60 languages available). ✔ Best FREE app forlearning fast. Speak French Fluently in Real Conversations WithLearn French application, you can now explore over 5,000 Frenchphrases for short daily conversations while having absolutely purefun! Whether you’re a tourist having a vacation in an Frenchspeaking country or someone who just wants to speak a foreignlanguage, this application will help you learn French phrases in afast, easy and enjoyable way. Why Our FREE App is Different ✔ Nointernet connection required – play where you want and when youwant (offline). ✔ 5,000 common phrases – audio pronunciations andphonetic transcriptions to show you how native speaker from Franceactually pronounce them. ✔ 11 fun games – a innovative approach topractice your listening, writing and speaking skills. ✔ 4 levelsfor learning: beginner, intermediate, advanced and expert. 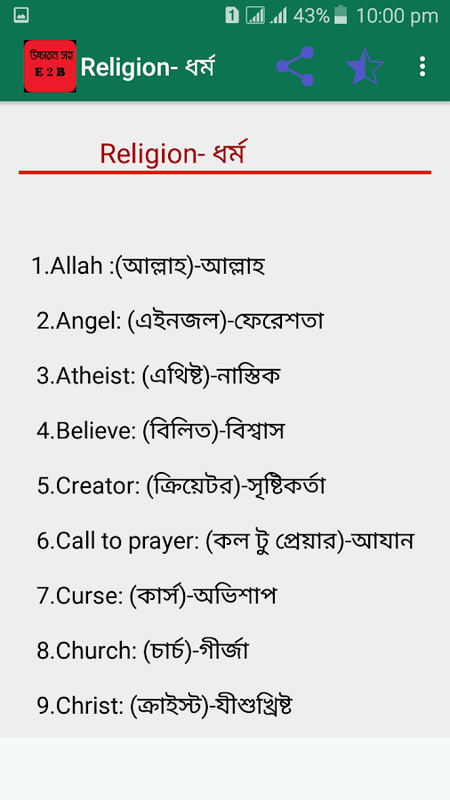 ✔ 20topics divided into 145 subtopics – so you’ll know what and when tosay each phrase. Topics for French conversation: Greetings,Conversations with friends, Basic sentences, Travel,Transportation, Hotel, Restaurant, Food, Shopping, Work, Businessetc. More Features to Improve Your French Speaking Vocabulary ✔Search and bookmark your most common expressions from thephrasebook. ✔ Earn points as your French skills progress and unlockall levels for free. ✔ “Random Categories” feature to randomlyselect the topic, subtopic and game. ✔ 60 languages –so you couldunderstand and speak each phrase easily regardless of which countryyou’re from. About FunEasyLearn: Fun Easy Learn has developed manyapplications to help people around the world learn foreignlanguages for free. Fun Easy Learn applications improve your Frenchskills: speaking, listening and grammar. The dictionary of the appshas human voice pronunciation for each common phrase to improveyour speaking skill. Speak French easily and fluently for travel,business or fun! Learn Polish with free lessons daily. Let Mondly teach you thePolish language quickly and effectively. In just minutes you’llstart memorizing core Polish words, form sentences, learn to speakPolish phrases and take part in conversations. Fun Polish lessonsimprove your vocabulary, grammar and pronunciation like no otherlanguage learning method. Beginner or advanced learner, traveler orbusiness professional with a tight schedule? The app works greatand dynamically adjusts to your needs. Explore language exercisesfor reading, listening, writing and speaking enhanced with adictionary, verb conjugator and state-of-the-art speech recognitiontechnology - you’ll feel like having your own Polish language tutorin your pocket. Download the language learning pill today and enjoythe benefits of learning a new language for life. The secret pathto language learning Remember the Polish language classes inschool? You started with hundreds of basic words and expressions,continued with tons of Polish grammar lessons and at the end of afull semester’s language course you could barely translate asentence or say “Hello!” to a foreigner. That’s the traditional wayto learn a language. Mondly has a different approach, that’sopposite to the average language course. This is how the future oflanguage courses looks like The App gets you started with a basicconversation between two people. You quickly start memorizing corewords, use them to build sentences and phrases, and at the end of a45-minutes module you are able to reconstruct that conversationwith your own voice. It’s an effective way to learn Polish phrases.State-of-the-art Natural Speech Recognition and Spaced RepetitionAlgorithms make the app effective for learning languages. Here arethe key features that make Mondly a great tutor for you:Crystal-clear audio and professional voice actors. Learn the rightPolish pronunciation from conversations between native speakers.State-of-the-art Speech Recognition. Mondly knows exactly how tolisten to your Polish words and phrases. You will only get apositive feedback if you speak Polish clearly and correctly. 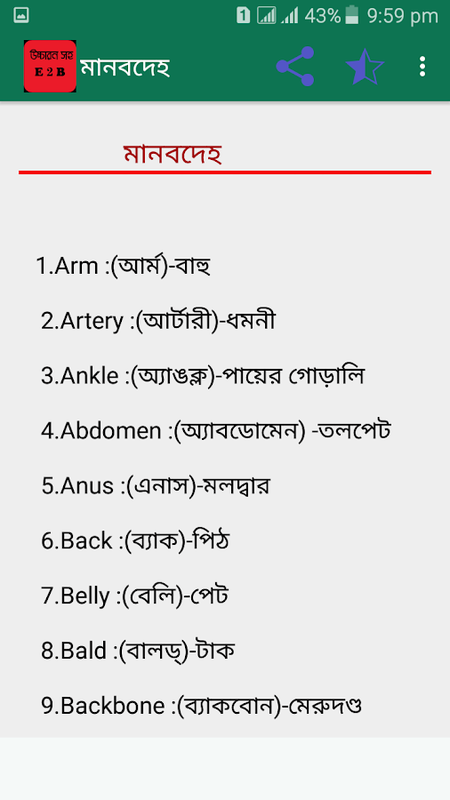 Thiswill improve your pronunciation. Useful phrases for realsituations. Memorizing hundreds of isolated words is not the way togo when it comes to learning Polish. Mondly teaches you Polishvocabulary by offering you core words and phrases. The app breaksthe learning process down into short lessons and puts them intothemed packs. Learn conversational Polish. Conversation is the mainreason to take this free course. It will help you build a corePolish vocabulary with widely-used nouns and verbs, and speakPolish clearly. Verb conjugations. If you want to learn more duringthis course, just tap the Polish verbs and get the full conjugationon the screen, including the translation. It’s faster and betterthan a dictionary. Advanced Statistics. The App uses intelligentreporting, so you can always follow your progress. Build yourvocabulary step by step and become better daily. The Leaderboard.See how your friends are doing and compete with people from allover the world to become the best learner in the Mondly communityfamily. Take the Weekly Quiz to become even better. AdaptiveLearning. Learning Polish is different from person to person. So wetaught the app to learn from your way of learning. After littletime spent together, Mondly will understand what suits you best andit will become your own guide and customized teacher. Kids willlove it as well. Before you know it, at the end of these Polishlessons, you will master the most useful 5000 words and phrases andyou will be on the fast lane to learning a new language. Play, Learn and Speak – discover common phrases for daily Italianconversation! ✔ 5,000 useful phrases for conversation. ✔ LearnItalian in your tongue (60 languages available). ✔ Best FREE appfor learning fast. Speak Italian Fluently in Real ConversationsWith Learn Italian application, you can now explore over 5,000Italian phrases for short daily conversations while havingabsolutely pure fun! Whether you’re a tourist having a vacation inan Italian speaking country or someone who just wants to speak aforeign language, this application will help you learn Italianphrases in a fast, easy and enjoyable way. Why Our FREE App isDifferent ✔ No internet connection required – play where you wantand when you want (offline). ✔ 5,000 common phrases – audiopronunciations and phonetic transcriptions to show you how nativespeaker from Italy actually pronounce them. ✔ 11 fun games – ainnovative approach to practice your listening, writing andspeaking skills. ✔ 4 levels for learning: beginner, intermediate,advanced and expert. ✔ 20 topics divided into 145 subtopics – soyou’ll know what and when to say each phrase. Topics for Italianconversation: Greetings, Conversations with friends, Basicsentences, Travel, Transportation, Hotel, Restaurant, Food,Shopping, Work, Business etc. More Features to Improve Your ItalianSpeaking Vocabulary ✔ Search and bookmark your most commonexpressions from the phrasebook. ✔ Earn points as your Italianskills progress and unlock all levels for free. ✔ “RandomCategories” feature to randomly select the topic, subtopic andgame. ✔ 60 languages –so you could understand and speak each phraseeasily regardless of which country you’re from. About FunEasyLearn:Fun Easy Learn has developed many applications to help peoplearound the world learn foreign languages for free. Fun Easy Learnapplications improve your Italian skills: speaking, listening andgrammar. The dictionary of the apps has human voice pronunciationfor each common phrase to improve your speaking skill. SpeakItalian easily and fluently for travel, business or fun! Play, Learn and Speak – discover common phrases for daily AmericanEnglish conversation! ✔ 5,000 useful phrases for conversation. ✔Learn American English in your tongue (60 languages available). ✔Best FREE app for learning fast. Speak American English Fluently inReal Conversations With Learn American English application, you cannow explore over 5,000 American English phrases for short dailyconversations while having absolutely pure fun! Whether you’re atourist having a vacation in an American English speaking countryor someone who just wants to speak a foreign language, thisapplication will help you learn American English phrases in a fast,easy and enjoyable way. Why Our FREE App is Different ✔ No internetconnection required – play where you want and when you want(offline). ✔ 5,000 common phrases – audio pronunciations andphonetic transcriptions to show you how native speaker from UnitedStates of America actually pronounce them. ✔ 11 fun games – ainnovative approach to practice your listening, writing andspeaking skills. ✔ 4 levels for learning: beginner, intermediate,advanced and expert. ✔ 20 topics divided into 145 subtopics – soyou’ll know what and when to say each phrase. Topics for AmericanEnglish conversation: Greetings, Conversations with friends, Basicsentences, Travel, Transportation, Hotel, Restaurant, Food,Shopping, Work, Business etc. More Features to Improve YourAmerican English Speaking Vocabulary ✔ Search and bookmark yourmost common expressions from the phrasebook. ✔ Earn points as yourAmerican English skills progress and unlock all levels for free. ✔“Random Categories” feature to randomly select the topic, subtopicand game. ✔ 60 languages –so you could understand and speak eachphrase easily regardless of which country you’re from. AboutFunEasyLearn: Fun Easy Learn has developed many applications tohelp people around the world learn foreign languages for free. FunEasy Learn applications improve your American skills: speaking,listening and grammar. The dictionary of the apps has human voicepronunciation for each common phrase to improve your speakingskill. Speak American English easily and fluently for travel,business or fun! Play, Learn and Speak – discover common phrases for daily Englishconversation! ✔ 5,000 useful phrases for conversation. ✔ LearnEnglish in your tongue (60 languages available). ✔ Best FREE appfor learning fast. Speak English Fluently in Real ConversationsWith Learn English application, you can now explore over 5,000English phrases for short daily conversations while havingabsolutely pure fun! Whether you’re a tourist having a vacation inan English speaking country or someone who just wants to speak aforeign language, this application will help you learn Englishphrases in a fast, easy and enjoyable way. Why Our FREE App isDifferent ✔ No internet connection required – play where you wantand when you want (offline). ✔ 5,000 common phrases – audiopronunciations and phonetic transcriptions to show you how nativespeaker from United Kingdom actually pronounce them. ✔ 11 fun games– a innovative approach to practice your listening, writing andspeaking skills. ✔ 4 levels for learning: beginner, intermediate,advanced and expert. ✔ 20 topics divided into 145 subtopics – soyou’ll know what and when to say each phrase. Topics for Englishconversation: Greetings, Conversations with friends, Basicsentences, Travel, Transportation, Hotel, Restaurant, Food,Shopping, Work, Business etc. More Features to Improve Your EnglishSpeaking Vocabulary ✔ Search and bookmark your most commonexpressions from the phrasebook. ✔ Earn points as your Englishskills progress and unlock all levels for free. ✔ “RandomCategories” feature to randomly select the topic, subtopic andgame. ✔ 60 languages –so you could understand and speak each phraseeasily regardless of which country you’re from. About FunEasyLearn:Fun Easy Learn has developed many applications to help peoplearound the world learn foreign languages for free. Fun Easy Learnapplications improve your English skills: speaking, listening andgrammar. The dictionary of the apps has human voice pronunciationfor each common phrase to improve your speaking skill. SpeakEnglish easily and fluently for travel, business or fun!